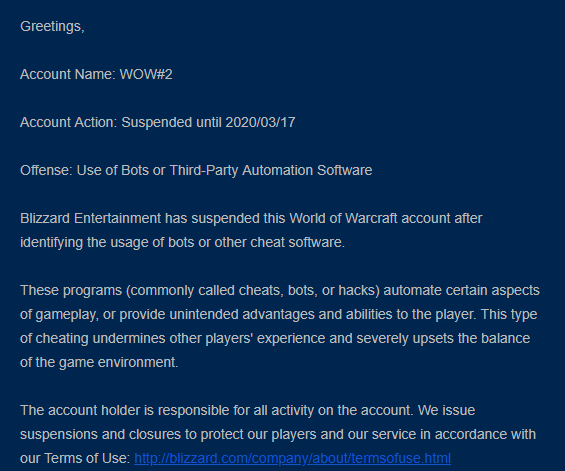 A week after the last WoW fishing bot ban wave, Blizzard has issued yet another WoW ban wave, this time, for other third party software, such as combat routines (GoHandsFree), auto clicking, as well as the EWT pack (Easy WoW Toolbox). What’s a WoW Combat Routine Software? Essentially, a WoW combat routine software, such as GoHandsFree in this case, is a tool designed to not only give you an unfair advantage over other players, but also automate your gameplay when it comes to combat, be it in PvP (Arenas or Battlegrounds), as well as PvE (raiding, mythic plus and even leveling). What this does is that once you import your class’ profile, for example, a DPS class, and then venture in an arena or battleground, the WoW combat routine software will take over all of your chores for you. Among the plethora of features it has to offer, you can find: a full arena/battle ground AFK bot, auto dispell, CC or interrupt, faking the enemies (canceling the casted spell before they interrupt), always facing the enemy, automated burst based on the enemy’s HP as well as a pausing system to prevent looking strange to others. Now, the thing is WoW has gone through a lot of such combat routine ban wave precedents, such as PQR, Type: Omega, FireHack, tMorph, Soapbox and even Honorbuddy, which are now either obsolete or shut down. Therefore, Blizzard is now targeting any other active options, and as such, the current WoW combat routine ban wave seems to have hit Easy WoW Toolbox (EWT), GoHandsFree (GHF), BadRotations (BR) and KungFu Master (KFM). So, whether you just wanted to climb the arena ratting ladder or just be a top DPS in your guild, these tools would’ve helped you achieve that, although they are a certain way to get banned from WoW. Now, let’s see how this current WoW combat routine ban wave affected the accused players! As per Blizzard’s “new” WoW penalty volcano, all players accused or found to have used any of the above-mentioned WoW combat routines were suspended for 6 months if this was their first alleged offense, as well as for 18 months or permanent bans if they had a history of similar issues. 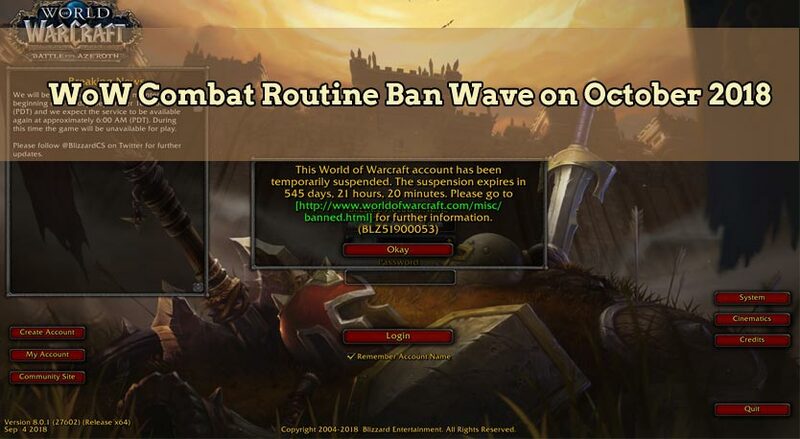 Also, perhaps unrelated but yet worth mentioning, is that this type of WoW combat routine ban wave has also taken place exactly 1 year ago, on October 13, 2017, for players using some of the above mentioned tools, as well as Type: Omega, FireHack and tMorph. And lastly, should you have been affected by the current WoW combat routine bot ban wave, here’s how to appeal a WoW ban, and don’t forget that we are here for you, should you require our WoW unban service!